Q-Vest - Battery Canister with E/O cable. 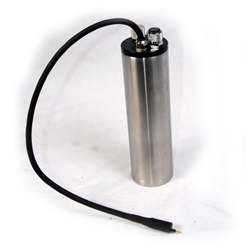 The stainless Steel battery canister has rotary switch and charging port. It is designed to mount on diver’s waist belt on the left or right side with standard E/O connector wet plug cable comfortably reaching the socket on the E/O bulkhead connector block. The rotary switch on the battery canister allows diver to set three levels of heat output as well as to completely switch the heat off. The Q-Vest is powered by 12V. The charging port also serves as a connector for a 20W LED light head.